Lessons From the Loaded Truck – He Said What?! Gary and I appreciate how our neighborhood association has a designated clean-up weekend twice a year. The association rents a huge dumpster and puts it in a field that’s just around our circle from us. It’s the perfect time for us to unload any large unwanted items that are allowed in the dumpster. 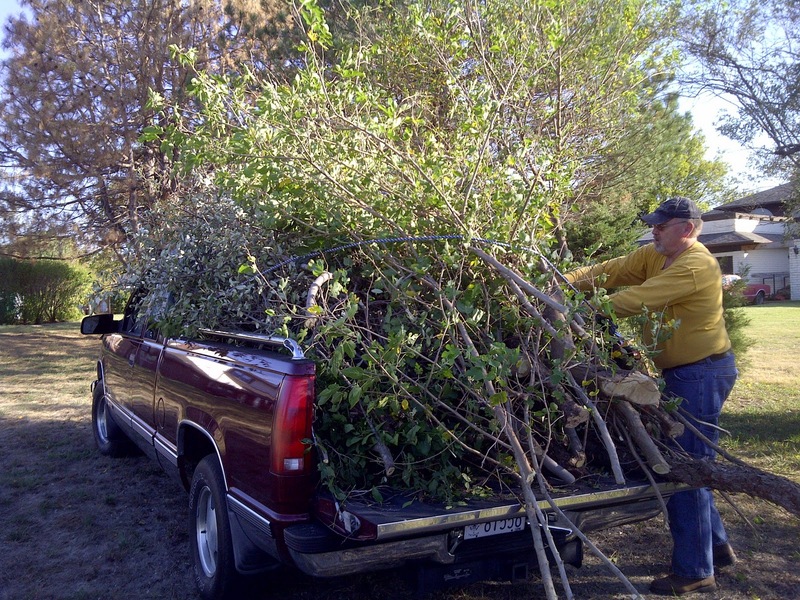 Our big goal, though, is to cut and trim many of our branches, bushes, and trees that have gotten out-of-hand or have died. This last clean-up time a couple weekends ago was no exception. The weather was perfect in every way for Gary and I to head outside and begin our chopping and sawing. It wasn’t long before the piles were growing all over our couple acres. It was time for the dying cherry tree to go, as well as an old long-dead spruce. Our huge Crepe Myrtles needed to be cut down low, and the violet bush badly needed some work. Off came the bottom branches of our evergreen that we lovingly call our Gumdrop Tree as we try to save it for one more year of Christmas lights. And there were many, many other branches and limbs and parts of trees that needed to be sawed down and disposed of. We used to use Andrew’s old truck for these days but now that he’s off to college we pile the mounds into Gary’s truck. What a blessing to have this means of hauling all that mess down to the dumpster! We drag and lift and load over and over again. It’s amazing how many loads we haul away! The truck is filled as full as it can be with each trip, that’s for sure. Gary has it down to a fine art of how to load the truck and it works very well. We pile it high, and then Gary uses a rope to tie it down before he drives off around the circle to unload. I either ride down with him to help unload, or I stay back at the house to do other things until he returns. One thing I’ve never done is to run along behind him, yelling for him to stop so that I can take some of the load off and carry it myself; or telling him that I need to rearrange the load; or offering to ride on top of the load to help hold it down. No, that would be silly! The truck is able to carry the load perfectly and the rope holds it secure. I have every confidence in the ability of Gary’s truck to do the job and do it well. As we loaded Gary’s truck, I was reminded of what I had read in Isaiah 46 recently. God began that chapter by talking about how the Babylonians would load their false gods onto donkeys when they were being attacked. However, soon both the donkeys and the false gods were taken into captivity. Neither was able to help the other. Then in verses 3 and 4 God reminded Israel: “…….you have been borne by me from birth and have been carried from the womb; Even to your old age I shall be the same, and even to your graying years I shall bear you! I have done it, and I shall carry you! And I shall bear you and I shall deliver you!” What an amazing promise that is true for believers today as well! It’s true for me and for you! God will be the same for our entire lives, from birth til death. He desires to bear me and to deliver me! He wants to carry my loads and bear my burdens! Just as I could trust Gary’s truck to carry the weight and the amount of our limbs and branches, so I can trust God to carry all the weight and the amount of my troubles and my burdens. Peter said in I Peter 5:7: “Casting all your cares upon Him, because He cares for you.” This carries the idea of throwing my cares upon God. Just as I threw those branches and limbs on the truck, so I can throw my cares upon God. And just as silly as it would be for me to chase Gary around the circle and try to carry the limbs myself, so it’s silly for me to throw my cares upon God but then try to take them back. Yet that’s exactly what I’m doing every time I pray but still worry and stew over my problems. Why is it so hard to just leave my burdens on the God Who WANTS to bear them for me? Why do I think that by losing sleep, or talking and talking about my issues, or continuing to try to solve my problems myself, or reading the next self-help book – that I can in any way accomplish any more than the donkeys and the false gods did in Isaiah’s time? Oh God, may I throw my worries and hurts and fears and pain upon You, fully upon You, and allow You to bear them and to carry me and deliver me! Just like Gary’s good old truck!